Mushrooms of all types are particularly attractive for the low-carb gourmand. Their meaty texture and savory flavors add unparalleled dimension to low-carb fare with relatively few calories and carbs. In vegetarian dishes, they mimic the texture of beef and poultry. And their low-carb volume reduces carb and calorie counts in many typically carb-heavy meals. Mushrooms can be sauteed, broiled, grilled, baked and roasted. A few, like enoki, are best eaten raw. Dried mushrooms must be rehydrated before using and, due to their leathery nature, cannot replace fresh mushrooms in bulk. They are best incorporated into recipes to lend earthy depth. · Purchase only the plumpest, firmest mushrooms and avoid those that are bruised or slimy. · Keep mushrooms in original packaging or in a paper bag and store on a refrigerator shelf, not in the crisper or vegetable drawer. · When you are ready to eat mushrooms, use a mushroom brush or dishtowel to rub them clean of grit and earthy residue. If you feel more comfortable washing them, give them a quick dip in water. Contrary to popular belief, mushrooms DON'T take on water and are NOT highly absorbent. But they do not like to be kept in a wet enviroment during storage, so simply pat them dry and place them on a paper or tea towel before storing. Fresh exotic mushrooms can be pricey, but you can infuse wild-mushroom flavor into a dish economically by using dried wild mushrooms. Try using white button, brown crimini or portobellos for the bulk of the recipe and flavor it using reconstituted dried exotic mushrooms. This technique works best with sauces, soups, ragouts and stews. To reconstitute dried mushrooms, cover them with boiling water and steep for at least 15 minutes. Remove mushrooms and squeeze to remove excess liquid, chop and add to the dish. For an added flavor bonus, strain the liquid to remove any grit and use as broth. · The familiar white button mushroom has a mild flavor that intensifies when cooked. · The brown cremini is related to the white button but is darker in color and denser in flavor. · Portobellos, with their meaty flavor and texture, are, surprisingly, small cremini button mushrooms that have been allowed to mature. 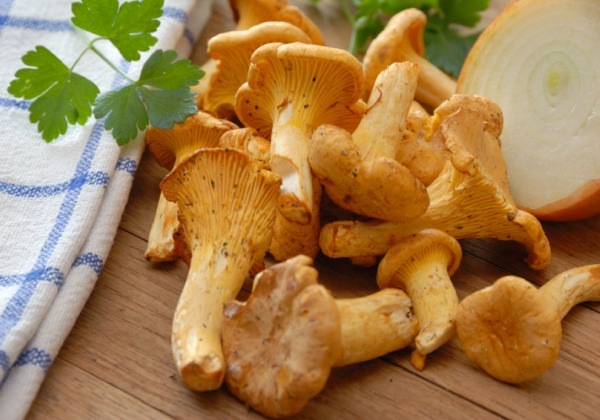 · Shiitakes have frilly umbrella caps that have a meaty texture when cooked. · Oyster mushrooms are the most graceful of the mushrooms with fluted caps, velvety texture and mild flavor. · The enoki grow in clusters and have fragile, long stems with tiny caps best eaten raw as garnish to salads, soups or Asian-inspired dishes. · The porcini, one of the most sought-after wild mushrooms, has a meaty texture and is typically found in late summer. · Chanterelles, frilly and lily-shaped, have a unique flavor with hints of apricot and almond. · Morels come in yellow and black varieties and are characterized by nutty, earthy flavors with honeycomb crevices perfect for sauces. · Known as the most expensive mushroom, truffles possess a powerful flavor, a little of which goes a long way. · Chanterelles nestled in fluffy, cheesy eggs give new meaning to breakfast as the most important meal of the day. This is sure to become a family favorite. If you want to learn more about mushrooms and where and when are the best times to go mushroom hunting, contact your nearest Mycological Societies or visit the Mushroom Expert site. Always remember that if you decide to do some mushroom hunting on your own, NOTHING beats experience. For your safety if you have ANY dobt of a mushroom you find, don't pick it.